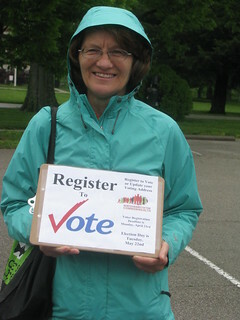 Despite some rainy, dreary weather today, Scott County KFTC members came out to the Georgetown Kite Fest today to register voters and talk about recycling. We registered a handful of voters and passed out a lot of information about our recycling campaign and left the event with several pages of signed petition for curbside recycling in Georgetown. Tomorrow, we'll be back at the Kite Fest from noon to 5pm and at a big Georgetown College Earth Day concert that evening.